related way at all. Correlation and Covariance also describe how strong these linear relationships are between the variables. Correlation and Covariance are very similar ways of describing the direction and strength of linear relationships between two variables. Correlation is a more well-known concept and more widely used. It will therefore be covered in the first half of this course module. Covariance will be covered in the second half. If two variables are "positively correlated," they move in the same direction. When one goes up, the other goes up as well. Two variables that are positively correlated have a correlation coefficient that is between 0 and +1. The closer the correlation coefficient is to +1, the more exactly the two variables move together. A correlation coefficient between two variables of exactly +1.00 means that both variables move in lock-step with each other. A correlation coefficient between two variable of 0 indicates that there is no relationship between the movement of one variable and movement of the other variable. If two variables are "negatively correlated," they move in opposite directions. When one goes up, the other goes down. When one variable goes down, the other goes up. Two variables that are "negatively correlated" have a correlation coefficient that is between -1 and 0. The closer the correlation coefficient is to -1, the more exactly the two variables move in opposite directions. A correlation coefficient between two variables of exactly -1.00 means that both variables move lock-step with each other in opposite directions. A correlation coefficient between two variable of 0 indicates that there is no relationship between the movement of one variable and movement of the other variable. The Sample Correlation Coefficient, r, is also known as the Product Moment Coefficient or Pearson's Correlation. Correlation does not mean causation. Correlation indicates that there might be causation between two variables but this may not be the case at all. There might be underlying causes there are not known and the correlation is merely incidental. Variables that provide causation but are not included in the correlation are often called "confounding variables." The Pearson correlation, r, indicates the strength of a linear relationship between variables. There might also be non-linear relationships between variables. Visual examination of a graphing of the data points can sometimes show a non-linear relationship between the variables that would not be evident from the correlation analysis. It is always important to look at the data points on a graph in addition to any numerical analysis performed on the data. We assume this data is sample data so the Correlation Coefficient is r, not σ which is the Correlation Coefficient for data from a known population. This same problem aboveis solved in the Excel Statistical Master with only 1 Excel formula. 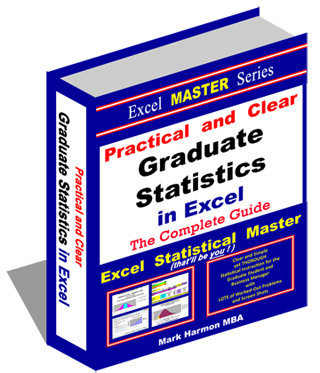 The Excel Statistical Master is the fastest way for you to climb the business statistics learning curve. The closer to +1 the correlation between 2 variables is, the more they move together in the same direction. The closer to -1 the correlation between 2 variables is, the more they move in opposite directions. The closer to 0 the correlation between 2 variables is, the less related and more random is their movement. r2 - The square of the correlation coefficient, known as the Sample Coefficient of Determination, calculates what percentage of total variance of the output (dependent variable) of a regression is explained by the variance of the inputs (independent variables). In other words, r Square represents the proportion of the total variation that is explained by the regression equation. The covariance also describes how linear a relationship is between two variables. The main difference between covariance and correlation is the range of values that each can assume. The Correlation between two variables can assume values only between -1 and +1. The Covariance between two variables can assume a value outside of this range. The more positive a covariance is, the more closely the variables move in the same direction. Conversely, the more negative a covariance is, the more the variables move in opposite directions. Two independent variables will have a zero Covariance. A Covariance of zero does not that two variables are independent though. The two variables may have a nonlinear relationship. This may not be picked up at all by the Covariance calculation. The Covariance calculation between two variables is very dependent upon the scale that the two variables are measured by. This is the main disadvantage of using Covariance instead of Correlation to compare two variables. The Correlation Coefficient is not dependent upon the scale used and provides the ability to compare different sets of data consistently. µx and µy represent population means and sxy represents a covariance from a population. We assume this data is sample data so the Covariance variable is sxy, not σxy which is the Covariance variable for data from a known population. The more positive the covariance between 2 variables is, the more they move together in the same direction. The more negative the covariance between 2 variables is, the more they move in opposite directions.